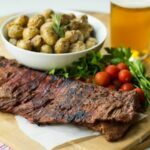 A juicy skirt skirt steak marinated in a Bloody Mary-like marinade, seared to juicy perfection on the grill and served with Parmesan roasted tiny potatoes is a flavorful meal the whole family can enjoy and it’s a snap to make. Of course, it’s hard to go wrong with meat and potatoes. But the humble shirt steak is often overlooked in favor of the more upscale filet mignon of the more mainstream flank steak. It’s a shame because there are so many reasons to love skirt steak in and I find myself choosing it more and more over flank steak. 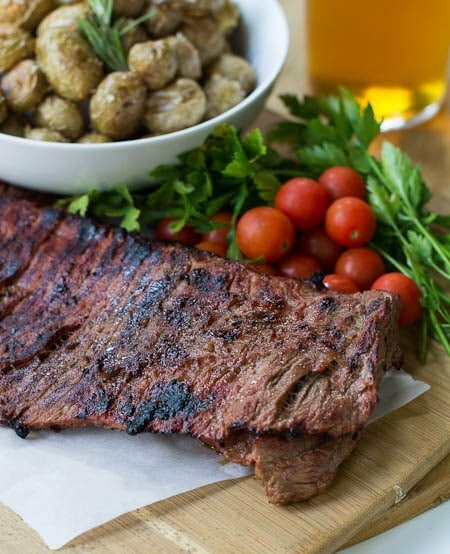 The skirt steak comes from the diaphragm region of the cow and it is a long, thin strip of meat that is packed with flavor. It is best cooked over high heat and only to medium-rare. 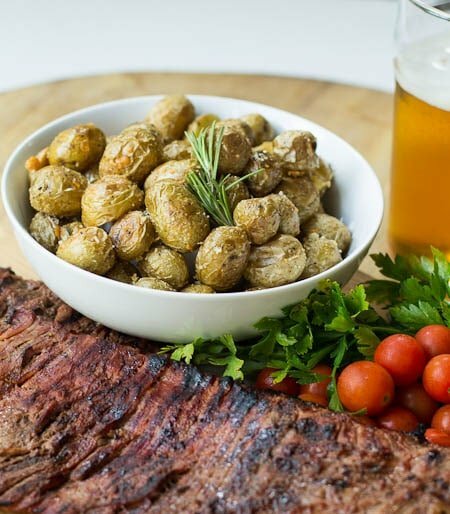 To spice up the marinade for the skirt steak, I used a wonderful Bloody Mary Spice Mix from a brand new specialty foods company, Madison Park Foods. They have a fabulous line of carefully blended, high quality spice mixes. Having a few spice blends on hand is a wonderful way to make meal preparation quick and easy. If you want to use your own Bloody Mary Spice Mix, use a mixture of paprika, celery seed, white pepper, cayenne pepper, and onion powder. Combine the ingredients in quantities to suit your own personal taste. Of course, a Bloody Mary Marinade must have horseradish. I didn’t add much, so this recipe is very family friendly. Add a little more if you want a lot of zip! 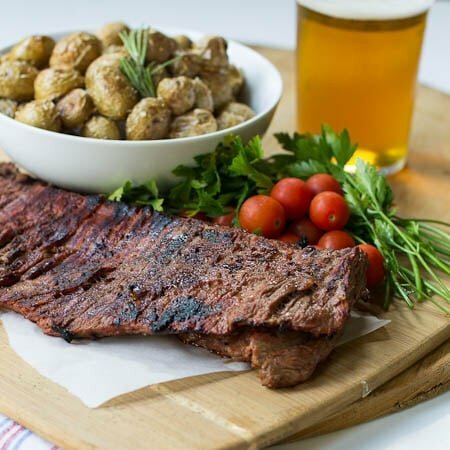 Skirt steak marinated in a Bloody Mary marinade, grilled to perfection and served with roasted potatoes tossed with Parmesan and rosemary. Combine first 5 ingredients in a ziptop bag. Place steak in bag and refrigerate for 4 to 6 hours. Preheat oven to 400º. Combine miniature potatoes and 1 tablespoon olive oil in a medium bowl. Use your hands to massage the oil all over the potatoes. Season with salt and pepper, place on a baking sheet and bake for 25 minutes. Remove from oven, stir potatoes, drizzle with 1 more tablespoon of oil, and sprinkle with rosemary and Parmesan Cheese. Place back in oven for 10 more minutes. Fire up a gas grill or charcoal grill. When hot, remove shirt steak from marinade and place on grill. Grill 3-4 minutes per side. 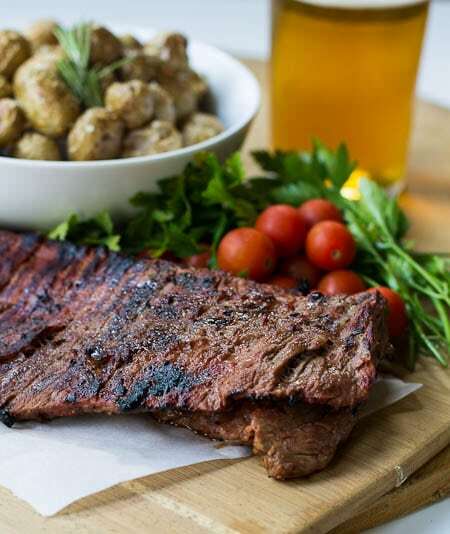 (Skirt steak is best served medium-rare.) Let rest before slicing against the grain. This entry was posted in Main Dishes and tagged beef, Bloody Mary Seasoning, Bloody Mary Steak, Madison Park Foods, skirt steak. Bookmark the permalink. Just made this…instead of marinating the steak I threw it in the slow cooker. Amazing!!! Great idea to use the slow cooker Molly! Will have to try that! I am craving a good steak dinner so this definitely does the trick. This recipe looks great, thanks for sharing! 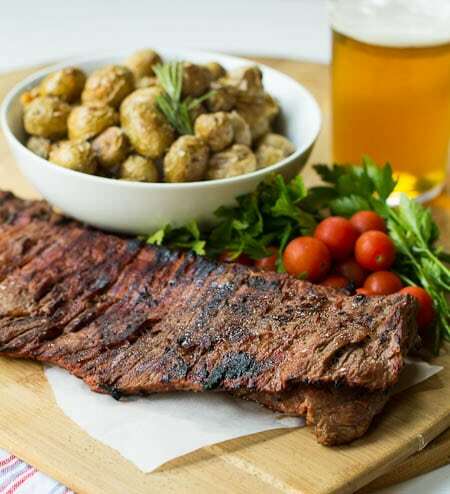 I like the sound of that… bloody mary skirt steak –yum! Looks absolutely delicious!